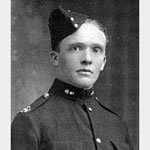 Grimshaw was 22 years old, and a Lance-Corporal signaller in C Company of the 1st Battalion, when he took part in the landing on W Beach on 25 April 1915 west of Cape Helles, Gallipoli, Turkey, at the opening of the Battle of Gallipoli. His job was to maintain communications between the units which had landed and the headquarters for the landing on HMS Euryalus. During the landing, the three companies and the Headquarters of the 1st Battalion, Lancashire Fusiliers, were met by a very heavy and effective fire from the company of Ottoman Empire troops defending the beach. This caused 533 casualties out of the 950 men who attempted to land. The survivors, however, rushed up and cut the wire entanglements notwithstanding the terrific fire from the enemy and after overcoming supreme difficulties, the cliffs were gained and the position maintained.